It is the duty of every Buddhist to pay homage to the Buddha before the commencement of any Buddhist recital. The following sentence in Pall should be recited thrice, and only after that may one take refuge in the Triple Gem. This is done only as a mark of respect by devotees in gratitude and in praise of the Buddha. Honour to Him, the Blessed One, the Worthy One, the fully Enlightened One. To be a Buddhist one must take refuge in the Buddha, Dhamma and Sangha for his guidance. All those who are already Buddhists are encouraged to recite the acceptance of this Holy Triple Gem in their daily life. Buddha was the holiest, virtuous and wisest personality who ever lived in this world His Dhamma (doctrine) is the ultimate truth of the Universe which explains the real nature of this world and of life as well. 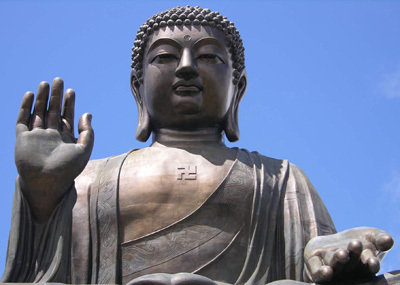 Sangha is the holy order of the Buddha, whose members lead a religious life as taught by the Buddha and who are also responsible for preserving his original teachings. By declaring the acceptance of guidance in the Holy Triple Gem one should not be led to think that he will thereby have to become a slave to anybody. Everyone must have some guidance for his own spiritual development. Every religion has certain sacred objects of veneration in which its followers are expected to have confidence It is the fervent belief in these sacred tenets which awaken the religious impulse in man and which in turn inspire him to lead a religious life. They give concrete shape as it were to abstract principles round which the followers of a religion rally. The three refuges in Buddhism are the sacred objects of veneration for its followers. For the second time I go to the Sangha as my refuge. For the third time I go to the Dhamma as my refuge. For the third time I go to the Sangha as my refuge. The following five precepts are recited and observed in Buddhist homes first thing in the morning and the last thing at night. These precepts are also recited before the commencement of all Buddhist meetings. By reciting these precepts before the commencement of any meeting or festival, Buddhists are reminded not to go against these principles and at the same time to purify themselves in order to better perform the tasks on religious activities before them. These precepts are not Commandments hence Buddhists observe them voluntarily. Every Buddhist must remember these precepts in their daily life and try to keep up to such principles. If Buddhists adjust their lives according to these five principles they could on the one hand live happily and peacefully in this world, and on the other help others also to live happily and peacefully. To observe precepts is like putting up a fence to protect ones own house against robbers. These precepts indicate the five arterial directions in which a Buddhist has to exercise his self-control. Thus the first rule calls upon him to control the passion of anger, the second the desire for material possessions, the third the lust of the flesh, the fourth cowardice and malevolence (the causes of untruthfulness) and the fifth the craving for unwholesome excitement. Every Buddhist must observe these five precepts in order to elevate himself morally and to be in conformity with the results of his right thinking. I take the precept to abstain from destroying of beings. I take the precept to abstain from taking things not given. I take the precept to abstain from sexual misconduct. I take the precept to abstain from false speech. I take the precept to abstain from distilled and fermented liquors that cause intoxication and heedlessness. These verses are to be recited in order to pay homage to the Triple Gem. These words explain the various great qualities or virtues attaching to the Triple Gem. By reciting these words one can understand the high qualities of the Triple Gem and so have confidence in them. These explanations of high qualities were given by the Buddha himself in one of his Suttas. He also advised the devotees to recite these words and to remember the �0�3��Buddha, Dhamma and Sangha�0�3�� in times of fear whether arising from external sources or through internal provocation, and such fear would vanish. This is because the Buddha, Dhamma and Sangha are free from all kinds of defilements and hindrances such as greed, anger and ignorance. Further according to the Buddha there are some people who pray to Gods or Devas in times of fear for their own protection not realising that the same gods are themselves not free from greed, anger and ignorance. It has to be remembered that even gods themselves are subject to fear. Therefore for our protection it is more advisable to remember the Buddha, Dhamma and Sangha (here Sangha means community of arya sangha) who are free from all fear. Well-expounded is the Dhamma by the Blessed One to be self-realized; with immediate fruit; to be but approached to be seen; capable of being entered upon; to be attained by the wise, each for himself. This Order of the Disciples of the Blessed One namely, these Four Pairs of Person. is an incomparable field of merits to the World. FORGIVENESS OF SHORTCOMINGS Since there is no such thing in Buddhism as making a confession for forgiveness of our sins, some people perhaps due to their lack of knowledge of the Dhamma, often ask why we should recite something to confess. The following stanza is recited by people not with the purpose of confessing their sins but to seek pardon for any of their shortcomings. It may sometimes occur due to our negligence, ignorance misunderstanding or forgetfulness we may do something bad, or allow the mind to stray and dwell on some unwholesome ideas. Occasionally we may even commit grevious wrong though unintentionally. By reciting the following stanza we gain a sense of satisfaction and consolation to our own mind besides serving as a reminder to ourselves not to repeat such mistakes. On the other hand by expressing our thoughts in this way and admitting our own faults without thinking that we are always infallible, we encourage others also to admit their shortcomings and to improve themselves. This will also befit us to be more mindful of ourselves and to guard our action, speech and thoughts, particularIy so in the presence of holy people and at sacred places. I have done aught wrong, forgive. O Master ! O Victor, Greatly Wise.